Many of our students have taken on the responsibility of planning and implementing a myriad of science related events on campus such as our annual STEAM event and Science Fair. We have students that are now attending Ivy League and prominent UC's/CSU's. The Pre-Medical Pathway at Santa Susana High School is the road to success for any high school students with aspirations of pursuing a medical degree and profession. The rigorous courses are designed to foster the passion and creativity of young minds to actively participate in the fast-developing medical field. Our curriculum prepared today’s students for tomorrow’s challenges by providing them with hands-on, real world experiences and challenges that can be applied directly to their college and professional experiences. 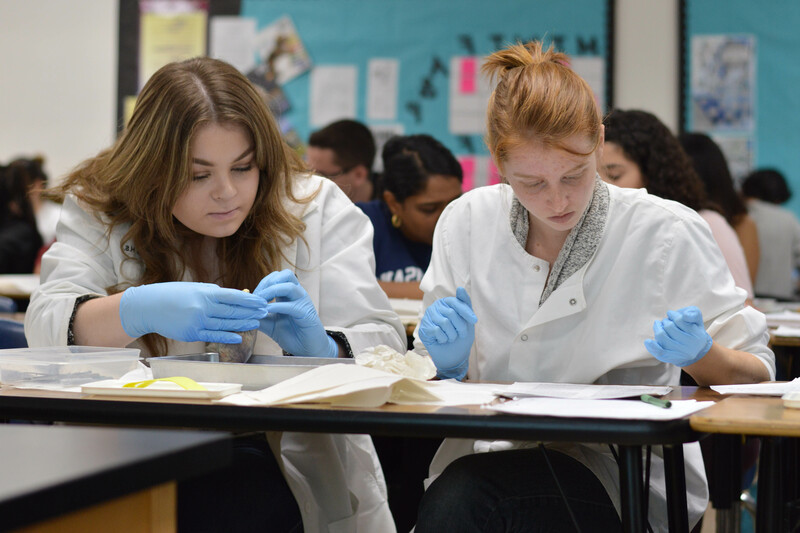 Students who join the Pre-Medical Pathway will take 4 years of science classes that incorporates hypothetical-deductive reasoning and project based learning opportunities across grade levels to increase their cognitive abilities and abstract thinking skills. In addition, the courses aim to prepare a variety of learners for a variety of medical-related careers. Students will gain specific content knowledge and skills to build a foundation of knowledge needed to successfully pursue a medical career. This course designed to equip students with a foundation of health knowledge that will aid in their journey toward mental, physical, and emotional wellness. The course provides a comprehensive health program that promotes wellness and health literacy, with an emphasis on developing lifelong and positive health-related attitudes and behaviors. It provides students with a biological, anatomical, and physiological overview of the human body, how to advocate for and comprehend their own health concerns, how to access public healthcare, and gain a global view of public health concerns. The ultimate goal is to empower students to make informed choices that promote the health and wellness of themselves and others by exploring health careers, prevention, treatment, health management, and mental and physical well-being as it pertains to the high school adolescent and the community around them. Anatomy and Physiology is a detailed study of the structures and functions of the human body systems. Various materials, apparatus and dissections of assorted specimens are used to provide laboratory experiences in this area. It is designed to provide an extensive background for students with an interest in the health sciences and related fields. The course is designed as an inquiry based learning environment that provides students the opportunity to apply the content directly to hands-on experiences and real world case studies. Our students consistently report feeling better prepared and more confident than most of their classmates in their college science courses. AP Biology is a rigorous and demanding course, which is the equivalent of an introductory college biology course. It covers a broad range of topics such as cellular physiology, Genetics, Evolution, ecological diversity, and human physiology. The course is structured around inquiry in the lab and are given the opportunity to engage in student-directed laboratory investigations. The emphasis is on scientific thinking and analytical problem solving designed to prepare you to successfully pass the AP Biology Exam. Our AP Biology students successfully score higher than the national average in all assessed areas. Must complete a senior project. 40 units needed to certify in Pre-Med.